Lewis Graydon and Laura Telford outside the main entrance to Holiday Inn Express Middlesbrough, Centre Square. Middlesbrough’s largest hotel is set to celebrate its fourth anniversary, with a new management team in place, a renewed focus on the Teesside business community, and a number of awards. 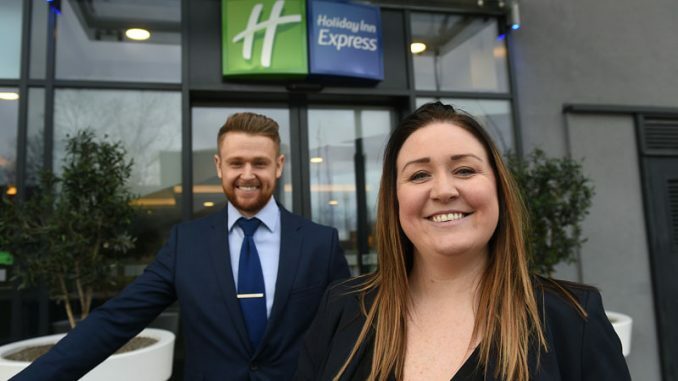 With a new general manager, deputy general manager and sales manager arriving in the past six months, the 159-bedroom Holiday Inn Express on Middlesbrough’s Centre Square has introduced a number of new services for business travellers and local businesses. Ranked number one for best value hotels in Middlesbrough on TripAdvisor, Holiday Inn Express Middlesbrough Centre Square is not typical of its brand because of its town centre location. It already offers business travellers a genuine full service at a budget, with inhouse dining, dining arrangements with a number of leading nearby restaurants, including Bistrot Pierre, Turtle Bay and the Fork In the Road, and free use of a local gym. The new management team, led by general manager Laura Telford, has added to this by introducing a new coffee, drinks and lunch menu, as well as enhanced meeting room and events service, and Laura has a clear vision for the future of the hotel. Valley, by providing the best possible customer experience through our team which we have recruited locally, trained and empowered,” says Laura, who was promoted from deputy general manager into her new role. For the local business community, new sales manager Lewis Graydon has introduced more flexible, fully-catered meeting room packages. He says: “With parking in the adjacent Lewis Graydon and Laura Telford outside the main entrance to Holiday Inn Express Middlesbrough, Centre Square. Cleveland Centre, our central location makes us an ideal place for business people to stay and to meet in Middlesbrough. We can provide flexible meeting room space for up to 80 delegates. The changes introduced by the new management team are clearly working, as the hotel won the Market Share Award and Operational Excellence Award, and was runner-up in the Hotel of the Year category in its hotel management group awards in early March. Further information about the hotel and its business facilities is available by calling Lewis Graydon on 01642 917113.